Back in the 1980s when we spent 3-4 weeks a year in Osaka on ragtrade business, we usually worked through lunch with one supplier. When asked what we’d like them to order in, we always asked for pork sandwiches which we now realise are the tonkatsu sandwiches that the world now seems to be hooked on. The toasted Japanese bread was very white and very light and filled with crumbed pork schnitzel, plenty of a delicious sauce and a little bit of greenery. Recently on Instagram I noticed that Abri, a well-known and popular Parisian bistro, is now serving tonkatsu sandwiches in the weekend only. I took a guess at what they’d put in their version and came up with this week’s recipe – a mix of both France and Japan. I decided to brine the pork the day before to keep it moist and tender. It’s not a necessary step but I recommend it if you can remember to think ahead. 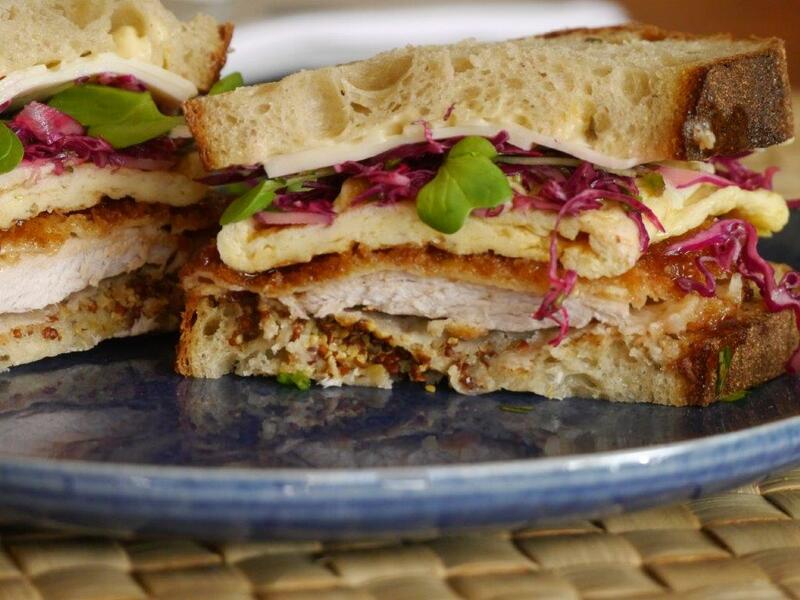 Also, this sandwich is just as good with chicken schnitzel and I’m sure even crumbed fish would taste great too. The day before, put the brine ingredients except the herbs and garlic in a pot, bring to a gentle boil and stir till the sugar and salt have dissolved. Remove from the heat and cool to room temperature. Put the pork in a container, add the herbs and garlic, pour over the brine, cover and refrigerate. The next day at least 2-3 hours before you want to cook the pork, pour off the brine, discard the herbs and dry the pork thoroughly using paper towels. Leave uncovered on a plate in the fridge to dry the pieces further. Crumb the pork schnitzels by dredging them through flour, then dipping in beaten egg and finally coating them in panko crumbs. Before cooking the pork make the slaw by mixing together the cabbage and herbs. Drizzle with a little olive oil, lemon juice and season with a little salt and pepper. Next make either 4 small 1 egg omelettes or, using 4 eggs, one large omelette that you can cut into 4 pieces. Add soy sauce to the beaten eggs before cooking. Keep the omelettes thin so they fit in the sandwiches. Cook the pork schnitzels in a little oil. The crumbs should be golden and crisp. Finally assemble your sandwiches. Spread a layer of mayonnaise on one side of 4 pieces of bread or toast. Spread wholegrain mustard on the other 4 pieces. Then layer up the pork schnitzel, a good amount of tonkatsu sauce, omelette, slaw and lastly a slice of emmental. Top with the other slice of bread or toast. Cut in half and enjoy! !